The 1st week of the New Year had an interesting theme. Other than freezing pipes (3 counts in 2 days, eek!) most of my clients were excited about taking action on different projects, yet unsure how best to proceed. So that’s why they all called me. My dear friend and colleague, Chuck Paetz with The Venture Group, and I were meeting to go over opportunities for a Commercial land sale we had worked to put together before the holidays in East Nashville. What are the costs to build? How many units / SF could you fit on a lot? What’s the highest and best use for the property? What does the community want and need? What does zoning allow or not allow? What could you Resale or Lease it for? What profit does the investor need to make the numbers work? 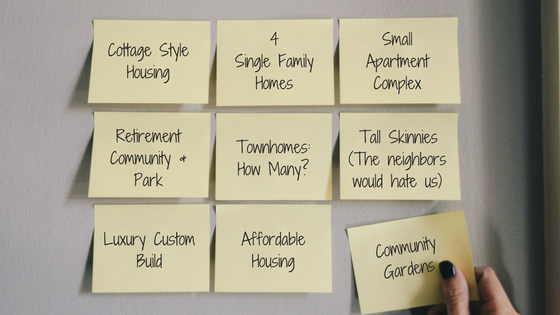 We scheduled a brainstorming session to throw around ideas and make sense of all of the options. Hey, we like to get creative. You don’t want to miss an opportunity even if you have a hunch of what would be the best project for a site. Well, our strategy on this one worked, to uncover that the Property didn’t. :/ Bummer. Even our most conservative numbers where just too much of a risk. So, we advised our Buyer to walk away. And they listened. Success! So How Do You Know When A Property Just Doesn’t Work? I respect when someone feels in their heart that a property is not right for them. The hardest part of getting over this hurdle then usually means translating those feelings into facts so we know how to best move forward. So what facts do you use to make these BIG, life changing decisions? Figure out the Numbers First – “May the odds be ever in your favor.” But Really. If the numbers don’t make sense, why would you move forward? If the risk and financials are going to cause you more stress and heartburn than joy, you should walk away. If you are diligent about running more numbers, you will avoid Money Pits, remorse, regret and wasted time. The numbers are my #1 go to for almost all of my decisions in business and life. Timing Matters – Markets do shift and it is important to know exactly where you are in a cycle. The more rushed a deal, implicitly the more risk so it’s important to figure out how the timing of a project will play a part in the market and your life. Many times, I have had clients put projects and goals on pause because the timing just wasn’t right. Communication is Key (*With your Team) – OVER communicating with your team can give you the solutions you need to make better decisions about the facts. The more I know, the more empowered I am to find you what you really want or advise you when something doesn’t meet your goals. This one I find is true for all of your life changing decisions, even those that don’t relate to real estate. The more you know, the better equipped you are to make better decisions. If a partner is telling you one thing, and your accountant is telling you another, and your attorney, and architect, etc is telling you another, then likely these are all points to consider and weight for your final decision. Your advisors have your back and can help raise points from various perspectives to paint a full picture of the situation. So, let’s get in touch about those New Year’s resolutions and how we can make them happen. Even if we have to pass on a property, re-evaluate a budget, or keep looking, I want to help you hit those goals AND enjoy the journey.